A hot and spicy Caesar salad for those who love a little variety in life. Assemble this salad in a tortilla bowl and wow your family and friends with a grand presentation. and combine the mixture until creamy. Add half the olive oil and stir to incorporate. mixing in evenly the chopped bits. 3. Season with freshly ground black pepper to taste. 4. Add the jack cheese and tomatoes and and toss the salad again to coat the greens evenly. 5. 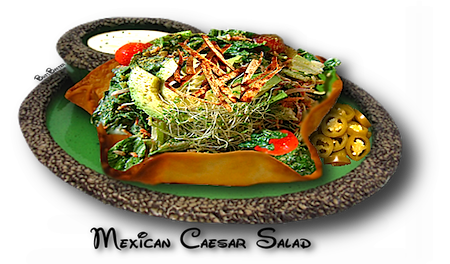 Evenly divide the dressed salad into the tortilla bowls. 7. Serve pickled Jalapeño round slices on the side for a little extra kick and flavor. adobo sauce from a can of chipotlè peppers in adobo sauce.